Two skins for the Pearl; a Black skin and a White skin. 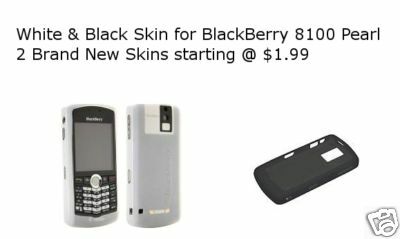 Personalize and protect your BlackBerry 8100 series smart phone with these BlackBerry Skin Cases. The rubberized exterior provides you with a sure grip, protecting the corners and sides of your BlackBerry against bumps and scratches. It also helps prevent your BlackBerry from sliding across your car's dashboard or other slick or angled surfaces. BlackBerry Skins feature easy-access openings for camera, audio ports, USB port, convenience keys and stereo jack. Plus, the keyboard and screen remain uncovered, so you can type and place calls as efficiently as ever.